When it comes to potential fire situations on board large commercial or pleasure craft vessels, being able to efficiently pinpoint the source enables quicker response times. The new Triton 8 Fire Alarm Panel from Sea-Fire is an addressable system enabling up to 256 detectors or manual call points. It offers a highly flexible configuration that can report not only smoke or fire, but potential hazards such as short circuits. The Triton 8 bears DNV Type approval, Wheelmark certification and ABS Design approval for use on Class vessels. Each of the systems 8 loops has 32 configurable zones, creating the 256 monitoring points. This addressable system is superior to traditional two-wire, zone-based alarm panels, which only indicate the general area of a fire event. It also reduces the amount of installation wiring needed and offers flexibility in the number of detectors/call points in a specific area onboard. The Triton 8 not only detects changes that indicate fire, but identifies failures that can lead to fire such as insulation faults, short circuits or loop cable breakage. It also provides measurement of any detectors that might malfunction due to clogging. Should the control panels main 24 VDC power supply be lost, an automatic switchover to backup battery power takes place, which reverses once power is restored. A convenient day/night-lit display panel shows a time- and date-stamped history of the last 500 events. The LCD panel features LED indicators and displays text in English, French or Spanish. Triton 8 is compatible with Apollo addressable marine detectors and accessories. Three levels of user access are available for the Triton 8. Level 1 provides any user with read-only access to data, audible alarm acknowledgement and test and day/night lighting functions. Level 2 users can further access the keypad with a code to reset fire or fault conditions, or trigger a prolonged voluntary system shutdown. Code access permits Level 3 users to also create and modify the units configuration, including adjustment of timers and setting passwords. The Triton 8 is programmed from the flat front panel keypad, or via a standard PC keyboard or a PC connected to the serial port. It addresses detectors with configurable expert cards. Components of the Triton 8 are protected inside a 9 x 8 x 4 steel case, with the flush-mounted aluminum display panel and keypad measuring 11 x 8. 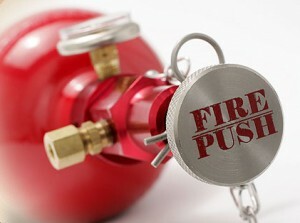 Sea-Fire offers full engineering support and design services for its fire detection and fire suppression systems. The company makes automatic and manual/automatic fire suppression systems for areas from 25-17,500 cu. ft.. It also carries sensors, control and display panels, engine shutdown systems and monitoring devices. Please take a few minutes to complete our survey. Your responses will help us to better understand and meet your needs.